Why is there a steady drip in the hallway every time it rains? 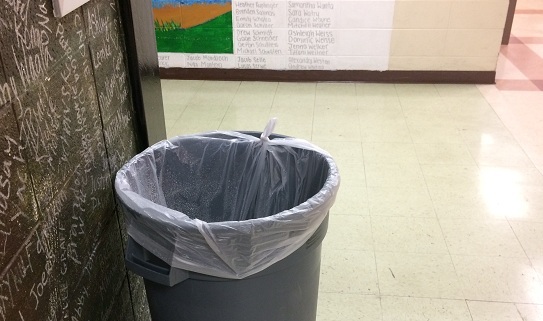 Contrary to the belief of some students at the West Bend High Schools, the garbage can in the hallway by West Library is, in fact, not for garbage. The true purpose of the can is to catch the water dripping from a leak in the ceiling at the corner of the V and S hallways. The leak has been a persistent nuisance for about a year. Tom Frigge, the facility coordinator for WBHS, said that he has called three contractors to find the leak, but so far they have been unsuccessful in locating it. Due to the freezing weather the leaks have been impossible to locate. However, with spring right around the corner Frigge plans to call in contractors to find the leaks within a couple of weeks. Frigge and the contractors have their work cut out for them, with a roof area of 470,000 feet to cover. There could be up to 15 leaks in the building, according to Frigge. The cause of the leak also remains unknown. “It’s a mystery until we find it,” Frigge said, adding that the existence of the leak is not an anomaly. While the leak is not the most prominent event in their lives, some students have taken notice. West English teacher Megan Coultas was one of the first to actually notice the leak, when she came into work on a Sunday last spring. Kristen Becker, another West English teacher, has observed different leaks in the West hallway over several years. Frigge is optimistic about locating the leak now that the weather is starting to warm. He predicts the leak will be fixed by the end of spring. “There’s always going to be leaks, but that one in particular has been really hard to fix,” Frigge said.